My Grandma's a Ninja is another NetGalley review! It is a picture book, not a chapter book, but I thought it looked kind of cool and I wanted to read it. 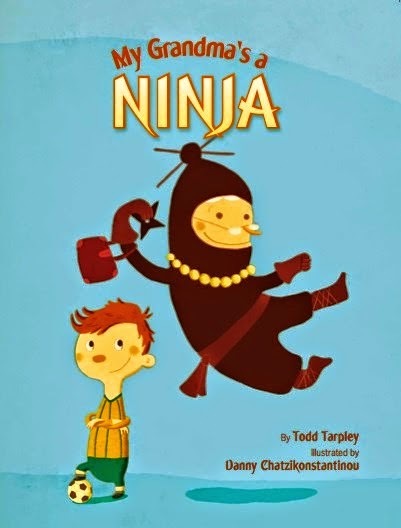 My Grandma's a Ninja is about a kid whose grandma is a ninja. His grandma ziplines him to school and teaches him karate moves. But when he is a soccer practice, she deflates the ball and they can't play soccer. All of his friends don't like his grandma anymore. He asks his grandma to stop being a ninja, but something special happens at the big soccer game. This book would be great for kids to read because it was easy to read and it had a funny story. I think it was a cool idea that the grandma was a ninja and could do all those tricks with ziplines and karate. I also thought the end was really funny and I didn't guess that it would happen.